not a creature was stirring, not even Lerner, Mark. In hopes that St. Strasburg soon would be there. while visions of perfect games danced near their brows. Lied down between rows for a summertime nap. I sprang from my row to see what was the matter. Looked down in the darkness, my eyes all asquint. gave the glow of summer to an object, small and round. but a bullpen cart, and eight tiny journalists. I knew in a moment, it was coach Steve McCatty! To the side of the fence, to the top of the wall! With the bullpen cart and McCatty and St. Strasburg, too. The scribbling and questioning of each of the mensch. Onto the mound St. Strasburg came with a bound. And his uniform sparkled with newness replete. and he looked like an elf, prepared for a stand. And fired off the pitches, and turned with a smirk. And then dialed back his changeup, a little bit lighter. as McCatty stared on, encouraging him loud. Tomorrow begins a new era for the Nationals, as phenom Stephen Strasburg takes the mound for the first time in a Nationals jersey. He will face the 23-33 Pittsburgh Pirates, whose offense could best be described as “anemic.” The Nationals have hit a rough patch, as their road trip went 3-7 against the Giants, Padres and hapless Astros, and that definitely hurt their position in the standings. The NL East has proven to be a surprisingly competitive division, and the Nats will have to work hard to find themselves out of the cellar. That will mean solving the problems in right field on the offensive side, and tuning up the mid-field defense to the point where the Nats maybe won’t lead the majors in errors. Currently, they’re on pace for 10 more errors than last season, a subject about which manager Jim Riggleman is quite testy. The postgame press conference turned a bit wintry when the subject came up, and Riggleman did his best to defend the actions of his players, but it’s clear this is an issue that he’s working hard on fixing with his players. The Nationals have also been the recipients of some frustrating calls at the hands of the umpires, which have caused some player fines and some incredulous announcers in both the radio and television booths. The Nats have to learn to roll better with the punches, which is a skill they have yet to develop. Runner called out when he was safe? Shake it off and get another on. Pitcher ejected unexpectedly? Warm up another arm and get ‘em out. 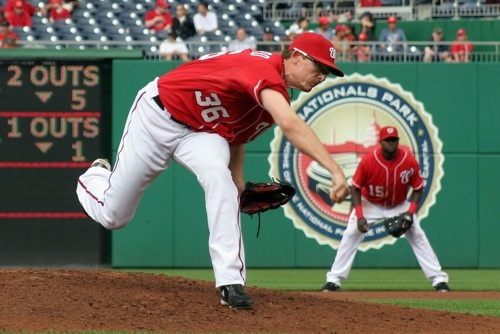 The Nationals are having difficulty displaying adaptability, and that could cost them. The Nationals finish their homestand on Thursday and head to Cleveland and Detroit for interleague action before returning back to DC to face the White Sox and Royals. The Nats have gotten to the chewy center of the AL Central, and aside from Tigers, they won’t face a team above .500 until they go to Atlanta at the very end of June. Strasburg’s second start will be against Cleveland (21-34), before his third start against the White Sox (24-32) back at Nats Park. The Nationals have the first pick in the amateur draft that runs tonight at 7:05. Look for the Nationals to take power-slugging catcher Bryce Harper with their pick, to complete what Dan Steinberg is calling the Harpsburg Dynasty. With the World Cup upon us, it seems that D.C. United has finally decided to stir. Their last two weeks, with a friendly victory over AC Milan, a U.S. Open Cup Victory over Real Salt Lake, and an MLS win over Chivas USA, has demonstrated that there’s life on the sidelines for United after all. They’ve displayed the ability to put together some offense, but it’s just in time for the World Cup Break. United has just one match remaining before the two week break, and that’s at Seattle, facing the team that beat them in the Open Cup finals last year. While United does have a home friendly against the El Salvador National Team (that one will sell out, so get your tickets early, it benefits the Spanish Catholic Center and United for D.C.), the chants of Barra Brava won’t be heard at RFK until July 15th. United comes back from the break on a three game roadtrip to Columbus, San Jose and New York before facing Seattle and Los Angeles the middle of July. Can we pause just a second and talk about why you should love D.C. United despite their 2-8-1 MLS record? It’s stuff like this. Saturday, Jaime Moreno was off the pitch as he finished recovery from a minor injury, but that didn’t keep him out of the game. Instead, Moreno jumped up into the stands, and played drums with Barra Brava. Barra has been unstoppable, unflappable, and loud-as-can-be all season long, and to see players that understand what it means to be a fan, well, it’s heartening. Barra also unveiled their new banner: Unleash the Namoff, in support of injured played Brian Namoff. Ivan Rodriguez wasn’t up in the stands with the Nats fans this weekend, or hanging out in the Presidents Club, and you wouldn’t catch an injured Redskin donning a dress and a pig snout. Bravo, Barra Brava, keep up the good work. You too, United. On Desmond, on Dunn (but not Wily Mo Pena). On Willingham, Pudge, and that Zimmerman fellow. I laugh with delight like a bowl full of Jello. Let’s party; I’ll buy us the first round of drinkies.